• Wedding or Engagement Wine Labels – Use a photo of the happy couple in order to create personalized labels to celebrate your engagement or wedding. A bottle of homemade wine sporting a custom wine label makes a great party favor, too. • Company Wine Labels – Upload your company logo and create custom wine labels to give out as holiday gifts to your customers. 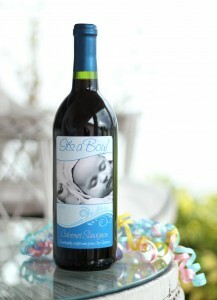 • Party Wine Labels – Create personalized wine bottles for a birthday party or get-together. This is a perfect way to show off your latest wines to your friends and family. • Special Wine Labels – You can use your photo to create a custom label to show off a special wine that you are particularly proud of. Differentiate your best bottles with quality personal wine labels. • Announcement Wine Labels – A unique way to announce a special event, such as an engagement, the birth of a child, or a new job. Since you use your own image, it’s personal. With Blue Wave, the possibilities are endless. Your personal photo will change the personality of the label to make it uniquely yours, perfect for your homemade wine. It’s easy to order Blue Wave. First of all, customize the text, using the standard or advanced editing options on the website. Once you’ve finished creating your own unique background, upload your own photo and view the preview online. Finally, place your order. It’s that simple! With hundreds of unique designs to choose from, you’re sure to find the right label for your homemade wine at Noontime Labels. Go to our website to take a look at the Blue Wave custom wine label. Then order your personalized labels for your homemade wine, mead, and beer today. This entry was posted in Custom Labels, Gifts, Homemade Wine and tagged Beer, custom wine labels, Gifts, Homemade, Labels, Mead, Parties, Personalized, Receptions, Wine by Noontime. Bookmark the permalink.